Black Hills minerals, petrified wood, fossils, agates, and crystals. Also specimens from other states and the world. Jewelry, gemstone beads, cabochons, books, cutting rough rock, rock garden rock, knives, antiques, spoon rings. 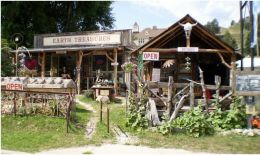 Located in Historic Keystone, look for the fence made from antique tools out front. Antique Shop is in the original ice house from the Box Elder Ranger Station. Local tourist information. We appreciate YOUR Business.